Tomy will release the following Radio wave inform figures on 19 February 2011. When detecting the radio wave (range 1.5 to 3GHz (WiFi, Nintendo DS, Mobile cell phone in case of Japan)), Pokeball or figure inform it with LED blinking. And this will talk (3 kind of sounds randomly) when it put on the palm. Size : height 8cm, required battery : Button battery LR44 × 2pcs. MediaFactory will release Pokemon World on 28 February 2011. It is a kind of craft toy, put the attached sticker onto the panorama as you like and some parts in panorama can be popped up, 2 kinds, size : 20cm x 30cm. 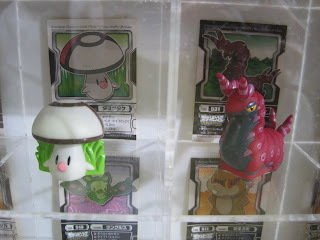 If interesting in Pokemon paper craft, please check paperkraft.net. Tomy and Takara Tomy Arts (TTA) will release the following plushies. Will upload the pics later. As for Tomy's Plush, please refer to this post or these posts. Tomy will release the following two kinds of remote controlled figures on 25 April 2011. A figure can be controlled the direction (forwarding and turning) by attached wireless controller, please see the following video of sample operation. Thanks for the video to Weekly magazine Ascii jp. Tomy will release the following figures of Monster collection (M series) and Monster collection plus (MP series). Will upload the pics later. As for previous released figures, please refer to these posts. From Apr to Jun, MC 61 figures (Gen.I to III) will be released as M series. New pose or just attach the stand ?? Not sure at present. Will update the details soon. Follow up post #2 on the preview of upcoming figures and plushies in Would Hobby Fair 2011 Tokyo. Thank you for the pics and credit goes to cooldpm, ktmonkeyj and matamanta. Again thanks for your time and pics. Very sorry about that, now revised files had been uploaded. And here is breakdown list of My Pokemon Collection from Banpresto based on WHF report. (Eng name/Jpn name). at World Hobby Fair Tokyo dated on 22 Jan 2011. 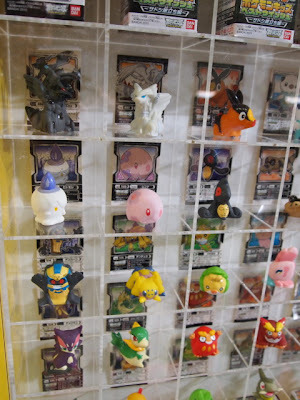 Banpresto displays sample of 'My Pokemon Collection', 72 new Pokemon BW plushies totally. Please refer to the following videos. 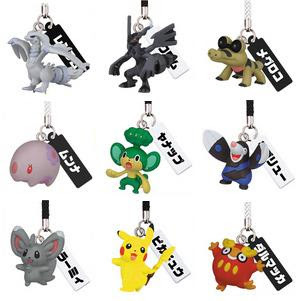 They are UFO catcher prize, size (height) 10-11cm, with key chain. Current displaying plushies are series 01 to series 12, each 6 pcs. April 2011 to December 2011. Some of them are exhibited with photos/illustration, some are actual sample plush. Following videos are uploaded just raw files to youtube, very welcome revising color, files join etc for more easy to see. Will update clear pics, all names and release schedule later. 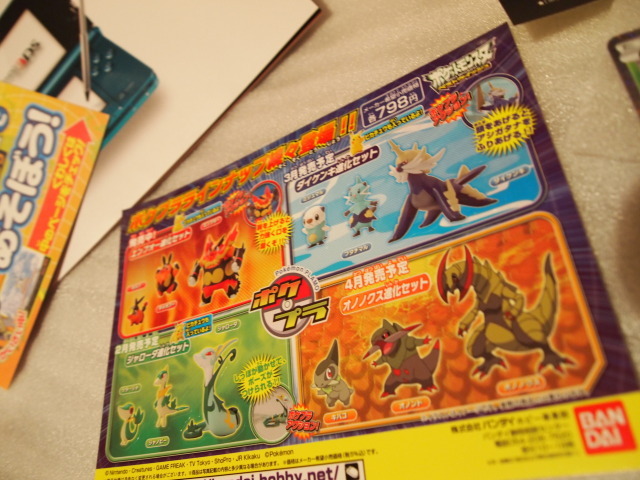 On the other hands, found other positive proof, 4/5th week of April to 1st week of May plusies are available (pre-order) in only this store at present, merchandise explanation of them mentions "イッシュ地方のポケモン全てをコンプリートできるぬいぐるみシリーズ" in Japanese. 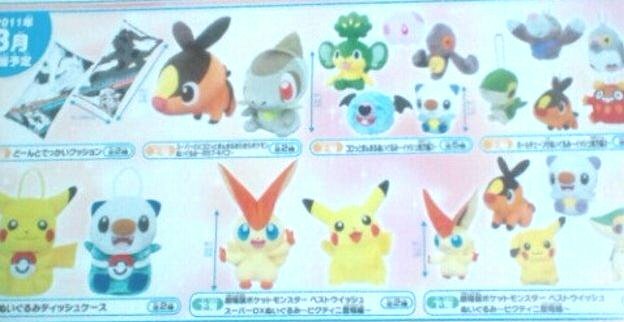 Means "Plush series that enable FULL COMPLETE every Unova region Pokemon ". Store quotes this wording from Banpreso's catalog for retailers, AAPF confirmed that with the store. 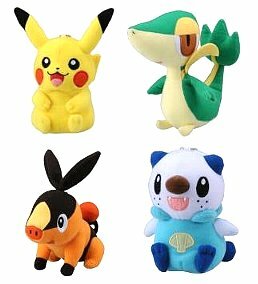 Anyway, we will see some more more more new plushies step by step, please don't be upset if not including your favorite BW Pokemon in the current videos and photos, it will come in front of you later. It was very nice to see you ktmonkeyj-san at WHF　:D , please check LJ community for more clear pics. 24 Jan 2011: Revised video files are uploaded and changed links. PokeCenJP Fukuoka will remove to new bld, new opening on 3 March 2011. As new opening anniversary, limited items (train card, Fukuoka PokeCen Original illustration goods) will be available. Also has been announced new store logo. 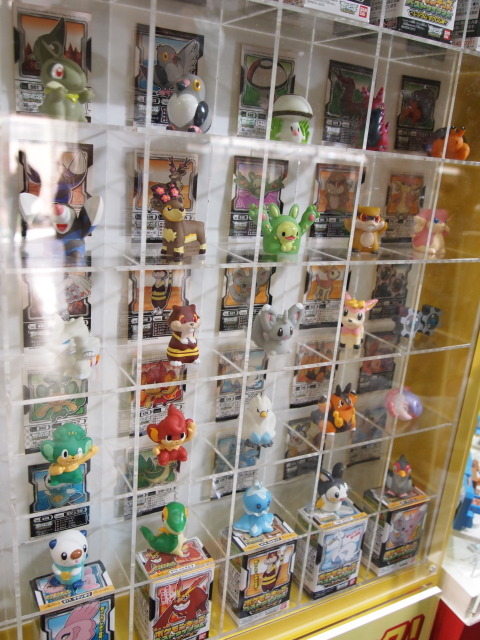 When Fukuoka store opened in 2003, Tomy clear version figures set (Pikachu, Totodile, Torchic) was released, but this time no info at present. Just trivia about the above linked illustration. We can see Oshawott has a headband in it, actually wearing a towel around his head. Fukuoka has the famous festival 'Hakata Gion Yamagasa (google img search)'. Probably it is based on their festival style. 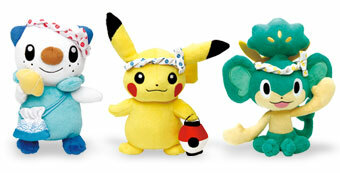 Here is limited plush of Fukuoka Pokecen new opening. Tomy will release the following 3 new figures of Monster Collection Plus (MP series) on 19 February 2011. Also 3 new figures of Monster Collection (M series) already uploaded photho will out same day. Some more info for the new plush series 'My Pokemon Collection', AAPF inquired the following points to Banpresto customer center. Is Banpresto going to release every BW Pokemon in "My Pokemon Collection" ? More than 153 Pokemon ? 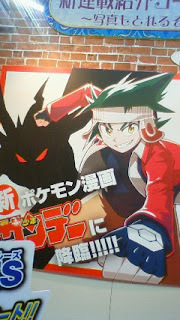 => Banpresto does NOT commit it at PRESENT officially, not sure after May 2011. The exhibition report at Osaka (2ch info in English, thanks to denkimouse) and customer center are deference explanation, of cause understand their deference positions and handling information. Seems depend on the business result in Apr/May, whether this big project go or not. It remind us Pokemon 151 project. 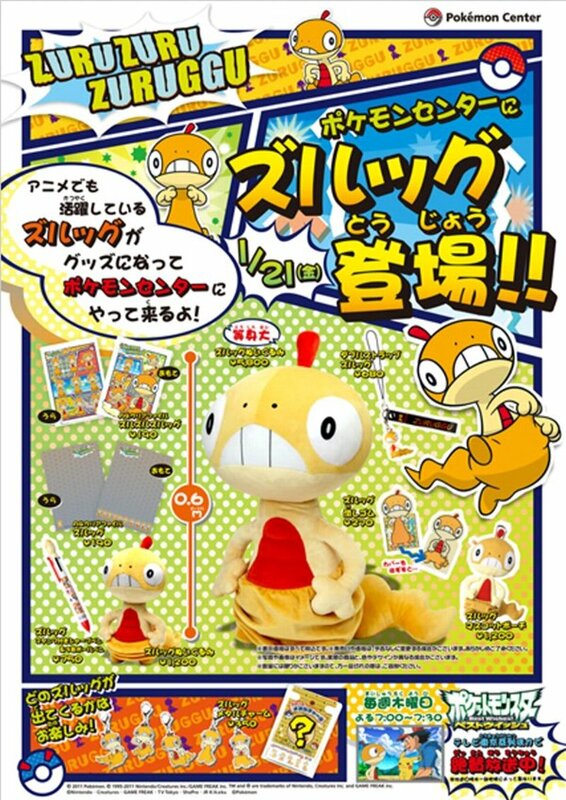 Meanwhile, all Pokemon plush fans in the world are expecting of "The most powerful collection of plush in history!" mentioned in the official site. OK, AAPF will go to Tokyo WHF to gather/check the current info and taking some more pics. Thanks anyway for the reply to Banpresto. 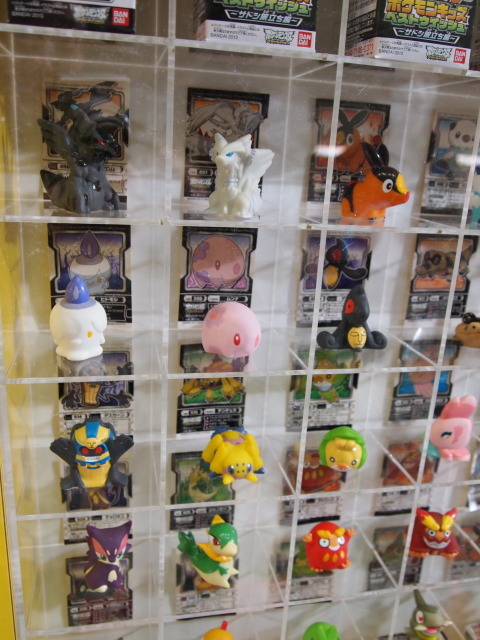 Took the video of My Pokemon Collection at World Hobby Fair Tokyo, please refer to this post. Continued yesterday post. 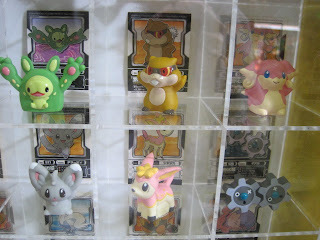 Here is a photo of partial upcoming "My Pokemon Collection" from Banpresto at WHF Osaka, million thanks for image to 2ch. Took the video of My Pokemon Collection at World Hobby Fair, please refer to report. 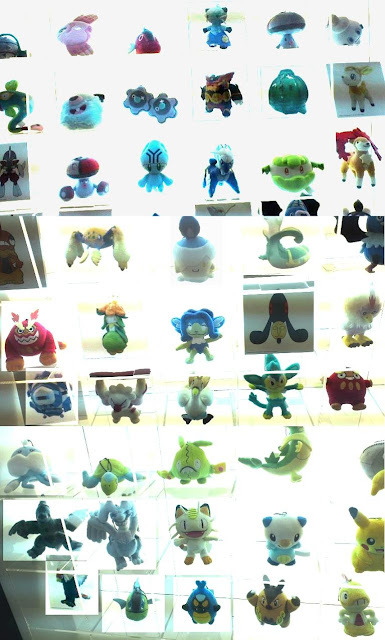 Unconfirmed Confirmed info from 2ch WHF plush repo, 'My Pokemon Collection' will run for one year, other release lines are #549 Doredia, #564 Purotoga, #577 Yuniran, #590 Tamagetake, #607 Hitomoshi, #625 Kirikizan etc. Refer to this photo at WHF Osaka. 19 Jan 2011: Above add part was confirmed and added pic link. As for Zuruggu (Scragg) merchandise, found some more items, we can see the eraiser, key strap and metal charm (5 kinds) in the following photo. If want to see large one, please just click the photo. New Pokemon manga will start in Shogakukan's Weekly Shonen Sunday magazine this spring. 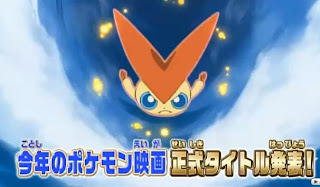 It was reported in Tsukuru magazine (February), they aim to expand the market, for more elder reader than Corocoro magazine. 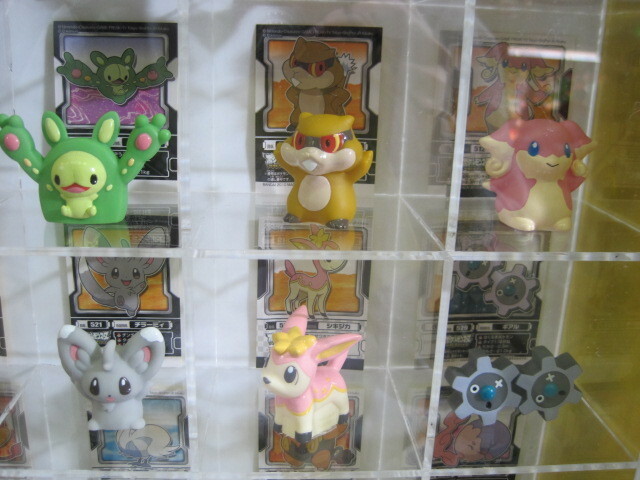 Photo for Pokemon Medal Collection BW 2 from Bandai release in the beginning of February 2011 is uploaded to the following previous article. BTW, as for TV program Pokemon Smash aired this morning, Musketeer Trio were just introduced for battling with Gima, nothing relation with the movie 14th. 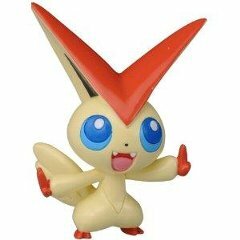 Photo for Pokemon Figure Bandai Pokemon Chara Kids BW release in March 2011 is uploaded to the following previous article. BTW, also Pokemon Movie 14th final title is announced at official site, logo is here. 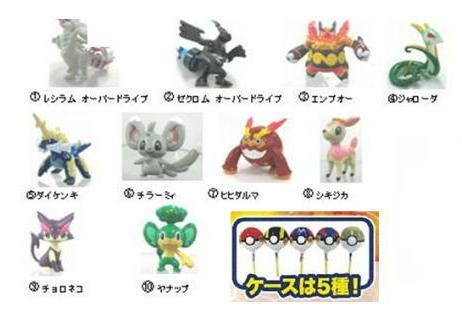 Photo for Pokemon Figure Bandai Pokemon Kids BW 3 release in March 2011 is uploaded to the following previous article. 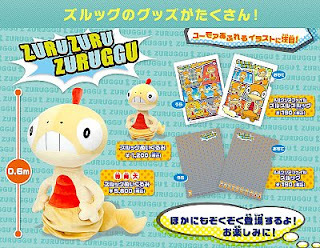 Scraggy (Zuruggu) promotion will be started. PokeCenJP will release the Zuruggu Life Size plush and other merchandise on 21 January. 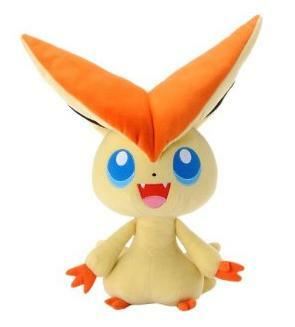 As for other items, please refer to plush, figures of previous posts. Also please check other article Zuruggu Item3. Just short info from the latest CoroCoro magazine gathering from twitter. Thanks to waruomi. As for movie, some more info will be announced at the official site in the evening JST.this weekend. meaning 'What is relationship between Black/dark hero and Zekrom !?'. So we will see 'Black/dark hero' later. Here is final movie 14th title logo from official site. 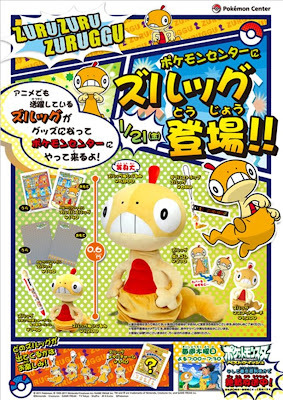 Takara Tomy Arts (TTA) released the following Pokemon Plush Full Body Puppet on 7 January 2011, height 19-23cm. Tomy will release the following 3 new figures of Monster Collection (M series) on 19 February 2011. Also 3 new figures of Monster Collection Plus (MP series) will out same day, detail is unknown at present, will update them soon. Please refer to this post. BTW, as for Pokemon Tomy figure clear version of #144 Articuno, #145 Zapdos and #146 Moltres, AAPF received the reply from Tomy customers support center about existence of them, result is 'not existed'. However the linked existing clear figure is nice, a rose is a rose is a rose. Last Sunday 9th January, Pokemon info TV show program Pokemon Smash (aka Pokemon Sunday previous TV title) aired. It showed the illustration of the Musketeer Trio and the trailer for the Victini movie. Next week they will announce final movie title officially. 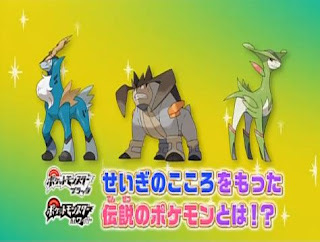 In the illustration of Musketeer Trio, comment says "What Pokemon is having justice heart ?". Following YouTube link around 0:15 is not so clear saying, unknown the position of Musketeer Trio in the movie at present, or just introduce for new Pokemon TCG March release ? Anyway we will see more info this week, CoroCoro magazine release, announcement from official site probably then on air Pokemon Smash. Photo for Pokemon Plush Round Form from Banpresto release in February 2011 is replaced in the following previous articles. Contains #495 Snivy, #529 Mogury, #551 Sandile, #554 Darumakka (it was unknown before), #644 Zekrom. 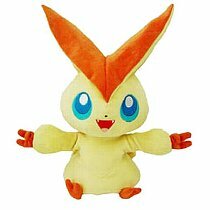 Photo for Pokemon Plush Zurrugu from Tomy is uploaded to the following previous articles. Zuruggu's release date : 29 January 2011. 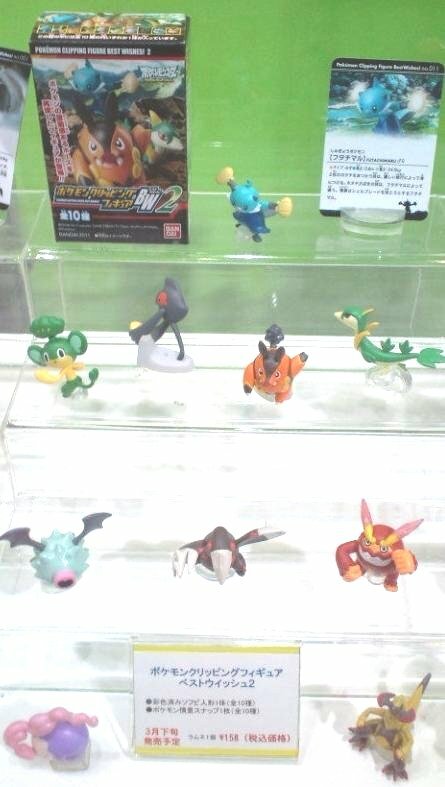 TTA (Takara Tomy Arts) will release the following 10 figures of Chupa Suprise BW 2 series in March 2011. Canday toys, size is 3cm, a figure is in one of 5 kinds Poke Balls. Will replace the photo later. 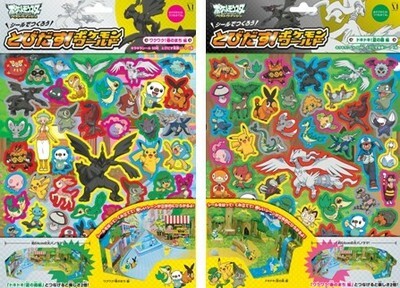 Photo for Pokemon Monster Collection (M series) release in January 2011 is replaced in the following previous articles. Zuruggu's release date : 29 January 2011. Takara Tomy Arts (TTA) will release the following figures (Netsuke : Strap figure) in the beginning of January 2011, capsule toys, height about 3cm. 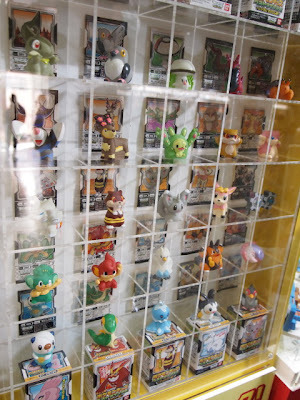 BTW, maintained Summary of Pokemon toys in 2011 (sorting by release month) for your budget plan. Also will update Pokemon BW toys soon. Hopig had good holidays and Hatsuyume in the new year. Takara Tomy Arts (TTA) will release the following movie 14th version items in April 2011, capsule toys. In the preview, two Pokemon are veiled as usual. Please see this article for the final image.